I'm delighted to say that Ecataromance, the electronic publishing arm of Catanetworks, have given A Secret Treasure one of their Reviewers' Choice Awards for 2008. 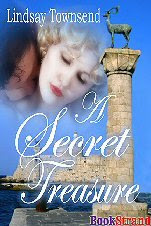 I'm really pleased with this, because A Secret Treasure is one of my quieter, sweeter stories. Details are here. Wow! Thanks so wonderful, Lindsay. I'm excited for you. You must share it on the HEA blog. Thanks, Bekki! It's been a wonderful surprise!